Surprise! 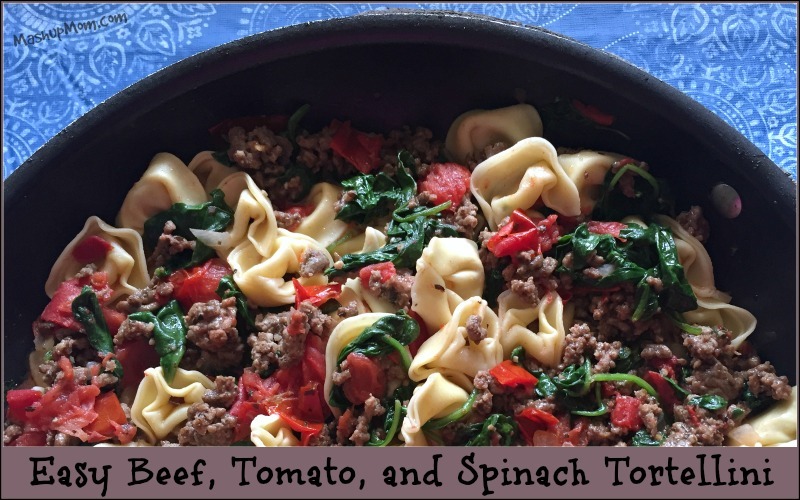 It’s a bonus belated Sunday Scratchups recipe on Tuesday, because I also wanted to tell you about this Easy Beef, Tomato, and Spinach Tortellini that I threw together with some of the ground beef I needed to use up this week. More ground beef, of course, disappeared into the taco zucchini boats I told you about the other day… then just as quickly disappeared into my family. It can be on your table in about 20 minutes start to finish, making it a great weeknight dinner option. It’s a great alternative if you like all the trappings of pasta, but want less of a heavy sauce. 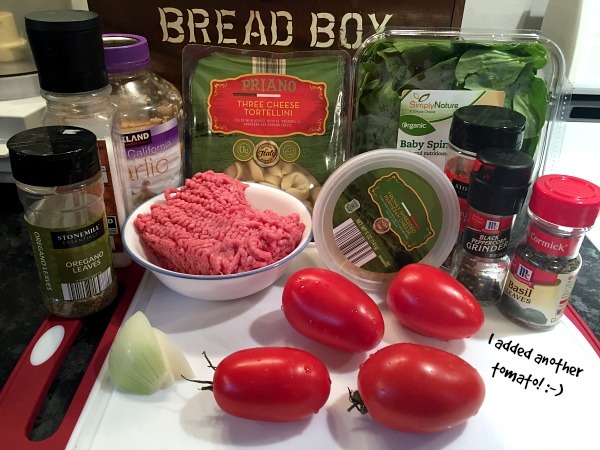 It requires just one pound of ground beef, yet is super meaty and satisfying. It’s a great way to use some of your fresh garden tomatoes in season. Cook tortellini to package directions, drain, and reserve. Meanwhile, brown ground beef, garlic, and onion in a large skillet over medium heat until beef is completely cooked through. 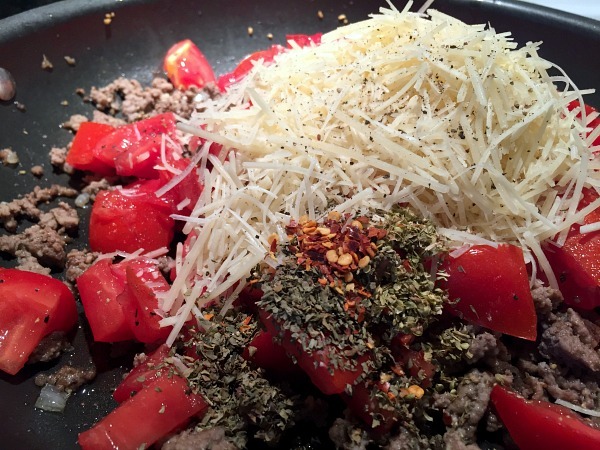 Drain beef, then stir in tomatoes, spices, and Parmesan. Cook the beef, tomato, and Parmesan mixture over medium heat for five minutes, then wilt in spinach. Once spinach is completely wilted, stir in cooked tortellini, heat through, and serve immediately. Optional: Top with additional Parmesan and fresh chopped parsley. 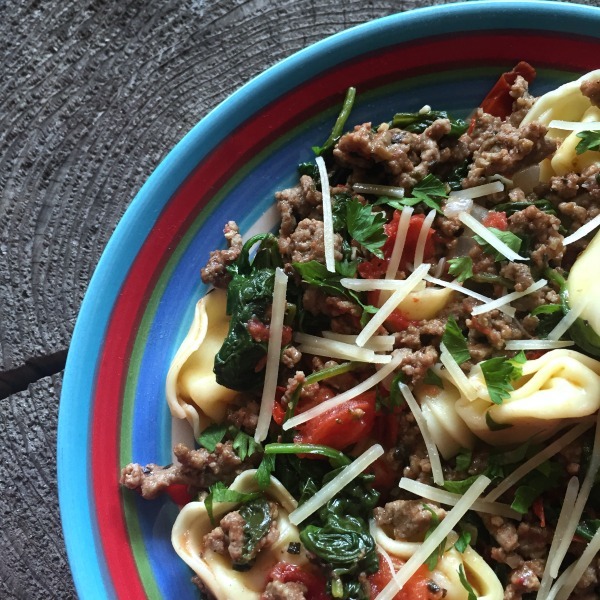 That’s it — You don’t need to add any more sauce; the fresh tomatoes and Parmesan suffice to make their own light sauce in this flavorful 20 minute beef, tomato, and spinach tortellini skillet recipe. You get your protein, veggies, and pasta all together in one simple dish — what more could you ask for in a quick weeknight dinner? 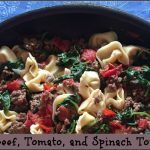 Fresh tomatoes and spinach are also so much more flavorful than the canned and frozen ingredients you often see in beef-spinach-tomato pasta recipes. You get your protein, veggies, and pasta all together in one simple dish here -- what more could you ask for in a quick 20 minute weeknight recipe? 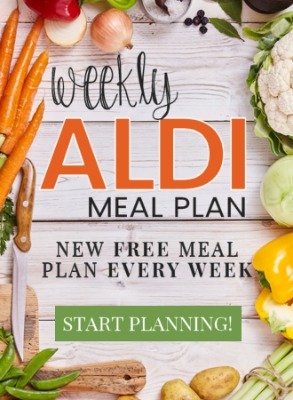 This ALDI tortellini is a great item to stock in your fridge as the foundation for any number of easy weeknight recipes. Yum! This wasn’t delicious. Thanks for the recipe. Sorry meant WAS delicious. Can’t edit. lol! 🙂 Glad you enjoyed it. Love this! It’s so easy and has so much flavor. My mom asked for the recipe after I made this for dinner last night. This was fantastic! 3 year old and husband approved!!!!! Thank You! Also shared on facebook! This was delicious though I didn’t get the “light sauce” from the tomatoes and cheese! Novice ?‍? This was yummy! I served this with the baguette and olive oil, as well as Aldi’s mini Cucumbers and Hummus. It was a hit at our house.